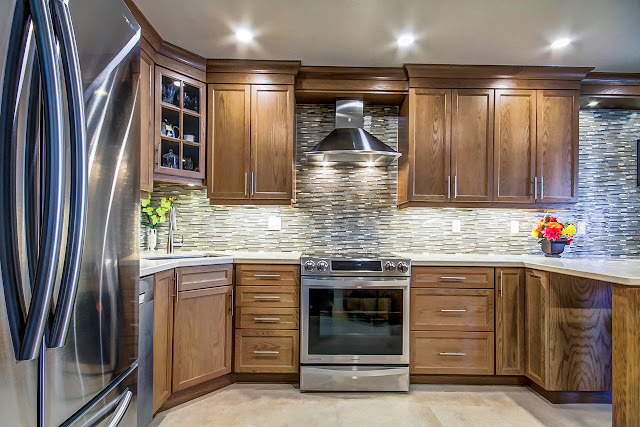 Traditional kitchen design featuring oak cabinetry. These homeowners had high expectations for their new traditional kitchen design. Oak cabinetry and an improved seating area were on "his" wish list. Increased storage space, and a better layout for cooking and food prep topped "her" list of priorities. Storage additions included a pots-and-pans drawer and a pantry. 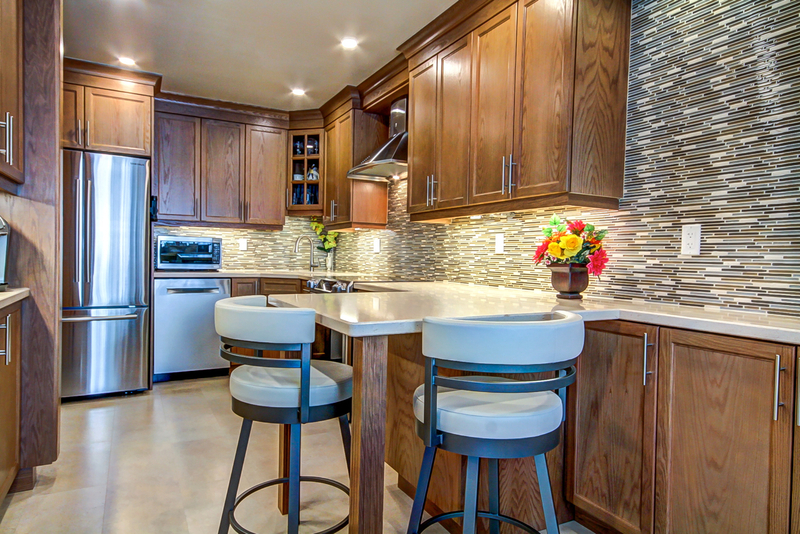 Traditional kitchen design featuring Caesarstone quartz countertops. Traditional kitchen design with Torly's EverTile flooring in Pembroke. 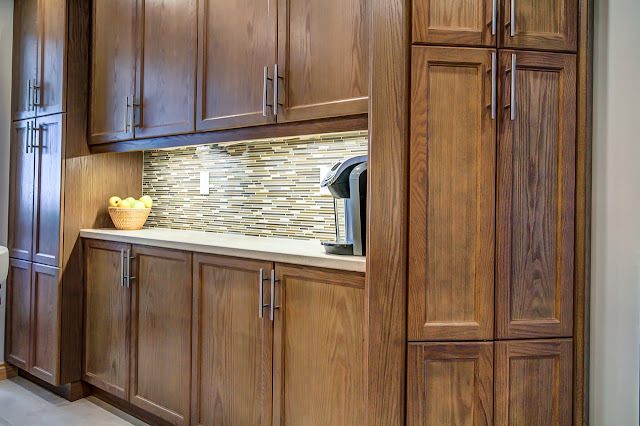 Traditional kitchen design with pantry storage and glass and stone mosaic tile from Sarana Tile. Caesarstone quartz countertop on Urban Effects HDF cabinetry. Bath design by Monarch Kitchen & Bath Centre. These homeowners wanted a clean, modern and masculine design for their busy family of boys. "Although the design has an adult feel, it suits the family with multiple drawers for storage in the vanity and the installation of a new bathtub," says Monarch designer Jackie Schagen. 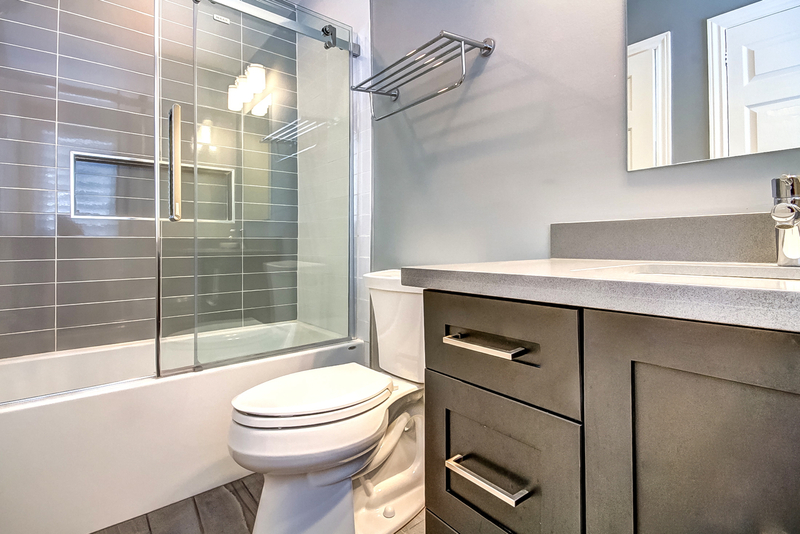 A hotel-style towel rack adds to the contemporary feel and helps keep the space tidy. Modern bath design by Monarch Kitchen & Bath Centre. Artwork Acciaio porcelain tile from Sarana Tile. Bath design by Monarch Kitchen & Bath Centre. It seems design isn't Janet Dawson's only passion. Riding since she was 10, Janet was on McMaster University's equestrian team but took a break from riding for about 25 years to work on her career and raise a family. "When I turned 50, I knew that with my children finishing high school and soon moving on to university, I'd have more time to pursue my own interests," says Janet. She decided to get back into riding and purchased a quarter horse to ride for pleasure. "As I got 'back in the saddle,' I found I was really enjoying the riding and decided to get back into competing." Janet purchased another quarter horse more suited to showing and began preparing to show in the American Quarter Horse (AQHA) circuit. 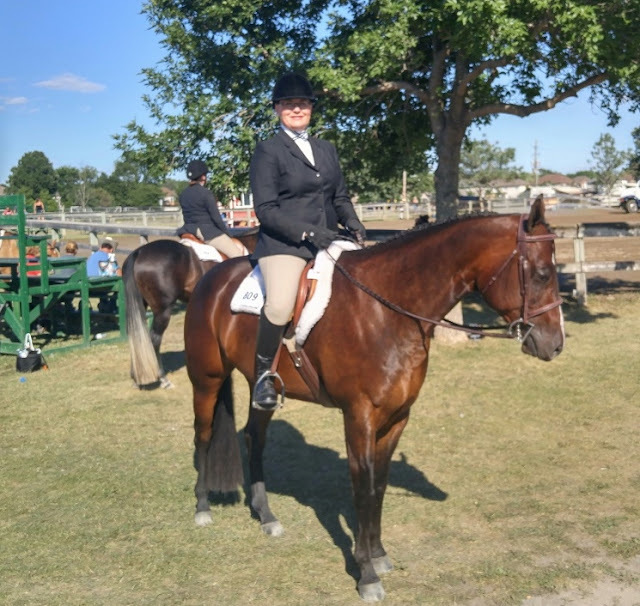 She is currently with JS Quarter Horses of Glencoe, Ontario, and her show horse Lopin Guy (aka Tyler) is housed and trained by Suzanne Pickard and Jason Duquette. "As Tyler is quite far away, I am only able to see him once a week," explains Janet. "I ride my pleasure horse, Rosco, who I keep at a farm near Uxbridge, at least three times a week and often more closer to show season." From April to November, Janet participates in shows in Michigan, New York, London, Orangeville, Ancaster and Ottawa. Modern technology has allowed her to integrate her busy show season with a busy work schedule. "When I'm at show, I stay onsite in a travel trailer where I can often be found working on designs, responding to email and talking with my clients." Janet had a successful first year showing in the AQHA. "I showed in the Rookie Division, which is for new riders to the circuit," explains Janet. 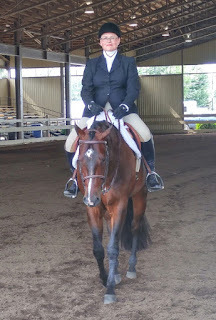 She placed first in North America in Rookie Hunter Under Saddle and fourth in North America in English Equitation. For the 2017 show season, Janet will be showing at a higher level in Hunter Under Saddle - Level 1 Novice Amateur, and still qualifies for the Rookie Division in English Equitation. "I have also added some new events for 2017, including Rookie Horsemanship, Rookie Showmanship and Walk/Jog Trail," says Janet. Choosing a company you can trust to renovate your home can often be a challenge for homeowners. As kitchen and bath designers for over 35 years, we understand that the best way to put your mind at ease is to let you read what our happy clients have to say and present you with the facts you need to make the decision that's right for you. My wife wanted her kitchen renovated and after asking around to friends who had had a kitchen renovation we decided to approach Monarch Kitchens to ask for a quote. All of the staff at Monarch kitchens made us feel welcome and took a lot of the stress out of such an intimidating project. Right from the start to the finish the renovation was done in an extremely professional manner. Most people have had scary stories of booking with various contractors who didn't keep their word. Monarch was not like that at all. In a world that says "Buyer Beware" Monarch was a very welcome exception. I can say without a doubt that Monarch has very high ethical values and stood by their word every step of the way. They were always on time, on budget and had excellent workmanship. 10 out of 10 stars to Monarch Kitchens and all of their staff. I have no hesitation in recommending them to anyone wanting professionals to help in home renovations. 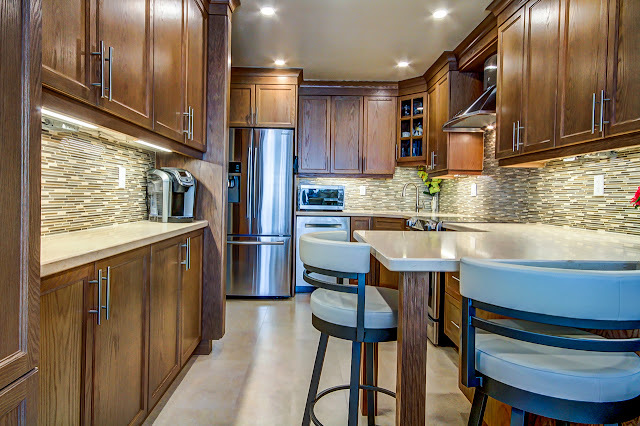 We recently had our kitchen and powder room renovation completed by Monarch Kitchen and Bath. Our first meeting with Monarch was with Kevin, who came by the house to thoroughly reviewed the space and spent much time with us to discuss our vision for the powder room and kitchen renovation. Kevin completed 2 design plan options and took the time to go over each of the plans with us. We visited their extensive showroom to make choices for flooring, cabinets, counter-tops, backsplash, and hardware. Kevin was very friendly, patient, and helpful throughout this process and we never felt rushed. He consistently kept us updated on costs in order to ensure we stayed within our budget. For the most part, the work was completed as outlined on the schedule provided. We were always informed of any change in schedule. 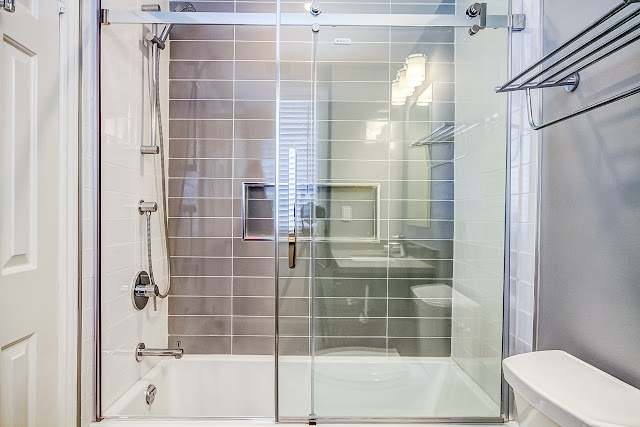 Everyone, including the plumbers and electricians, as well as the cabinet, flooring, counter-top, and tile installers were all very professional and addressed any questions and concerns we had in a timely manner. We are extremely happy with our beautiful new kitchen and powder room. Thank you to Kevin, Neil, and each and every member of the Monarch crew for all of your hard work and expertise. We would not hesitate to recommend Monarch to anyone looking to renovate their home. Why choose Monarch Kitchen & Bath Centre? 1. We are experienced and qualified. Take comfort in the knowledge that all Monarch designers are professionally trained and educated. Monarch has been a member of the National Kitchen and Bath Association (NKBA) for over thirty years. The NKBA promotes professionalism and ethical business practices within the kitchen and bath industry, and is committed to helping design professionals create more energy efficient living spaces. Monarch is a member of the Canadian Home Builders’ Association (CHBA). The CHBA is committed to a fair and competitive marketplace and provides members with opportunities to learn and grow. In 2012, Monarch became a Baeumler Approved contractor. 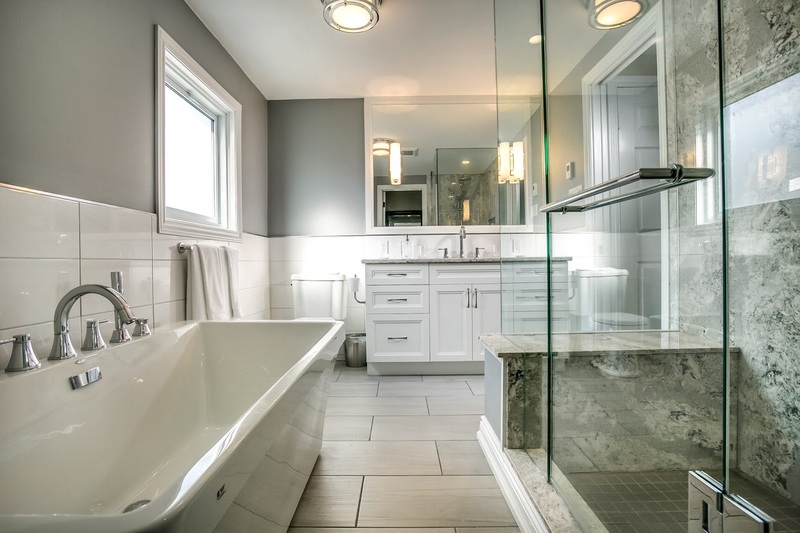 Baeumler Approved pre-screens home renovation companies to ensure their references check out and they have all the require insurance and licenses necessary to run their business. 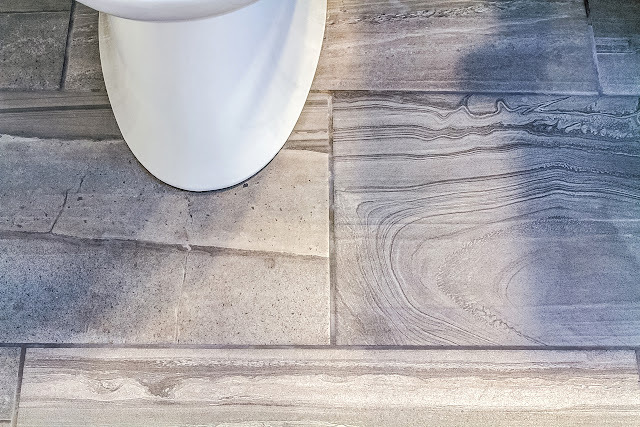 They also check with previous customers and the tradespeople and companies they employ on a regular basis to ensure a company they deem “Baeumler Approved” has a solid reputation in the industry and with their clients. In 2013, Monarch became a RenoMark and BILD Approved contractor. 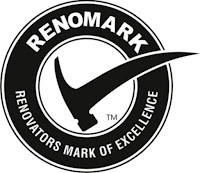 As a RenoMark approved renovator, Monarch is recognized as understanding the value of customer service as well as providing warranties and continually educating ourselves on trends, materials and new regulations. The Building Industry and Land Development Association (BILD) encourages innovations and excellence in the planning and building of sustainable communities and the redevelopment and renovation of existing communities. As a BILD approved contractor, Monarch must abide by a strict code of ethics. 2. We understand that our success depends solely on the satisfaction of our clients. Our primary goal is to help our clients design a space that not only reflects their personal style, but also meets their requirements for function and versatility – now and for years to come. Many of our new clients come to us as a result of referrals. Not only have they walked into a friend or family member’s newly designed space and been blown away by its beauty, they have also learned firsthand about our attention to detail, expert guidance and respect for their time. Click here to read our reviews on HomeStars. 3. We design and renovate homes, cottages and condos! Monarch offers customized design and renovation services for all rooms in the home, condominium or cottage. 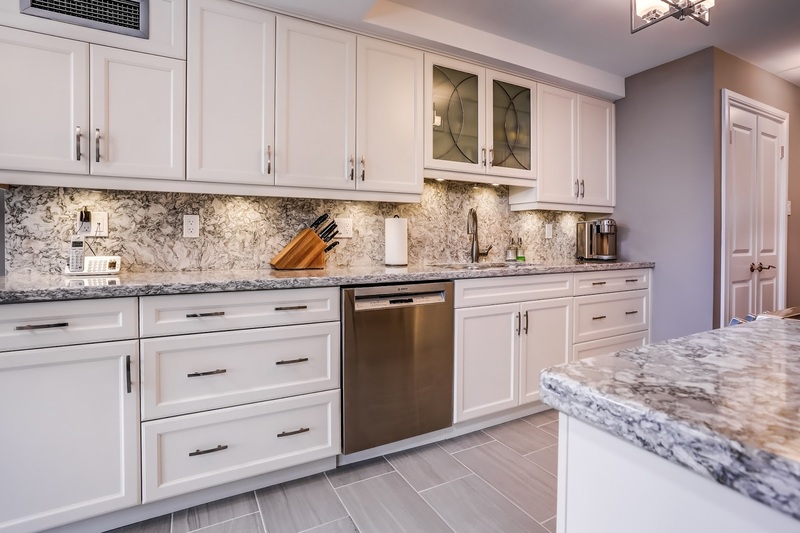 This service includes in-home consultations; detailed plans and designs; a written description of the scope of work for each project; computer-generated plans and perspective; "one-stop”shopping on a large range of cabinetry, tile, flooring, and plumbing fixtures; licenced, insured and bonded trades; complete project management; and several lines of cabinetry to cover a range of budget options. 4. We offer concierge services, too! Monarch offers a concierge service to help our clients manage the many steps and stages involved in a renovation. Our concierge service includes a pack-up service; professional organization; appliance moving; cleaning services; duct and filter cleaning; daily progress reports with pictures or video; product sourcing and interior design and decorating services. 5. We are your long-term renovation partner. Our commitment to you does not end when your design project is finished. We offer a one-year parts and labour warranty on everything we supply and install. Should something get broken or damaged, we will help you obtain replacement parts. We are always happy to make time for you, your friends and anyone you refer to us.